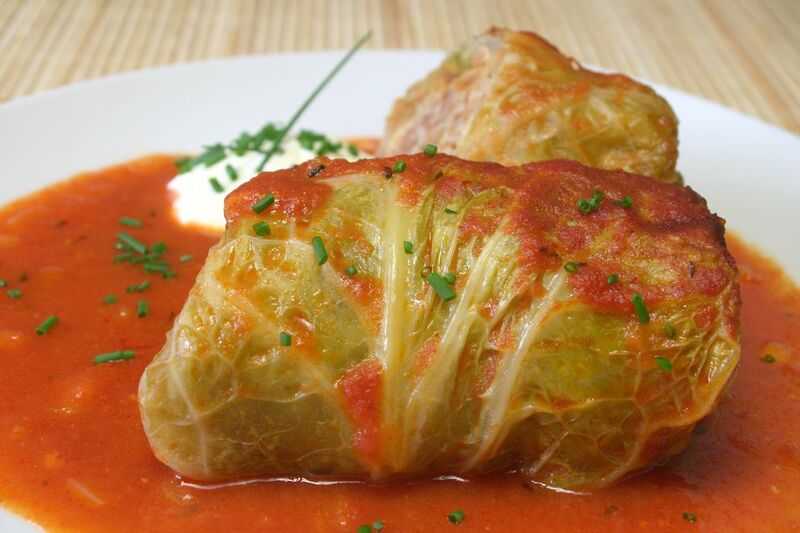 Ukrainian stuffed cabbage is known as holubtsi, which literally means "little pigeons." Fillings vary widely and can be meatless or contain any combination of meats, vegetables, and grains. The wrapper can variously be cabbage, beet, lettuce or spinach leaves, and even grape leaves in the grape-growing regions of Ukraine. The cooking liquid varies by region and family and can include broth, tomato juice, and sour cream. I've used a potato-buckwheat filling in this Ukrainian holubtsi recipe. Remove core from cabbage. Place whole head in a large pot filled with boiling salted water. Cover and cook 3 minutes, or until softened enough to pull off individual leaves. You will need about 18 leaves. When leaves are cool enough to handle, use a paring knife to cut away the thick center stem from each leaf, without cutting all the way through. Chop the remaining cabbage, and place it in the bottom of a casserole dish or Dutch oven. Drain the potatoes in a sieve or cheesecloth, twisting until the potatoes are dry. Transfer to a large bowl, and mix with a little vitamin C powder (ascorbic acid) or lemon juice so they don't turn dark, and set aside. Saute the chopped onion in butter in a small skillet until tender, and add to the potatoes, mixing well. Add 1/2 cup sour cream and rinsed and drained buckwheat to potato mixture, combining thoroughly. Season to taste with salt and pepper. Place about 1/2 cup of filling on each cabbage leaf. Roll away from you to encase the filling. Flip the right side of the leaf to the middle, then flip the left side. You will have something that looks like an envelope. Once again, roll away from you to create a neat little roll. Place the cabbage rolls on top of the chopped cabbage in the casserole dish or Dutch oven, seasoning each layer with salt and pepper. Pour 1 cup sour cream over the holubtsi, cover, and place in oven. Bake for 1 to 1 1/2 hours or until buckwheat filling is tender. Serve with pan juices or hot tomato sauce and more sour cream, if desired, or mix the pan juices with sour cream, and ladle it over the cabbage rolls. Cabbage rolls freeze well before or after cooking, and can be made in a slow cooker (see your manufacturer's instructions). Note: Since they can be eaten hot or at room temperature, mini cabbage rolls make great appetizers. Just spear them with a frilled toothpick, and you're good to go!